Firstly none of the other 3 people record seeing each other, Styles, Lovelady and Shelly. Secondly why not ask the other 2 woman with them, how long before Adams and Styles. There were more than 2 other women with them. Why would they be expected to notice when Adams and Styles left. Styles was asked by Sean Murphy about it and she said that they left no less than a minute after the shooting. Thirdly and most importantly, where did anyone ask any of the other people on the 3rd and 4th floors if they were in a position to observe the rear stairs? If so why wasn't this obvious step taken? How do you know that they weren't asked? Their positions have all been accounted for. With Dougherty excluded, none were in a position to observe the rear stairs until some time after the shooting. Problem is that if, as Stroud document indicates, that Garner was following Adam and Styles, and was close enough to hear them going down the stairs and then sees Truly and Baker come up. Close enough to hear them but she didn't see them as they headed down. If she recalled that accurately, then Oswald could have also passed by and been on the stairs below the fourth floor, following just behind Adams and Styles who were tearing down making a racket on the wooden steps in their three inch heeled shoes. The only person who placed himself anywhere near the stairwell was Jack Dougherty. However, that placement is highly doubtful. Dougherty was not reliable, due to no fault of his own. Dougherty was reliable enough to fill orders and check the fire alarm each morning. Mr. BALL - Now, what kind of work have you been doing at the Texas School Book Depository in the last few years? Mr. DOUGHERTY - Oh---shipping clerk. Mr. BALL - And what kind of work is that? Mr. DOUGHERTY - Well, that's when they bring the orders from on the second floor, and in other words, you fill them from the---they are orders, I guess you would call them orders, to fill from there, and outside of doing little odd jobs besides that---that's it. Mr. BALL - What time did you go to work? Mr. DOUGHERTY - Well, I got there---it was after 7 o'clock in the morning. Mr. BALL - Do you usually get there in the morning at 7 o'clock? Mr. BALL - Why do you get there at 7 instead of 8, when the rest of the men get there? Mr. DOUGHERTY - Well, you might say, I have a little---extra chores to do. Mr. BALL - You do that--you get there at 7 all the time, don't you? Mr. DOUGHERTY - Yes, I've been doing it for 11 years. Mr. BALL - That's what Mr. Truly told me, that you get there real early. Mr. BALL - And you did get there about 7 that morning? Mr. BALL - Let's see, Mr. Dougherty, you said that you have some extra chores--what are those extra chores? Mr. DOUGHERTY - I have to see to it that the water system is pumped up. In other words, the air pressure is up to where---up to 40 pounds so that if it isn't pumped up, the alarm goes off, and the ADT runs that alarm system, and we immediately call Mr. Truly and of course they call me. Mr. BALL - What is the ADT? Mr. DOUGHERTY - That's that---I don't know too much about it---it has something to do with the alarm system they have got down there. Mr. BALL - You mean the pressure, do you? Mr. BALL - Is that a fire-alarm system? Mr. DOUGHERTY - Yes--you could call it that. Mr. BALL - Now, what else do you do there early in the morning? Mr. DOUGHERTY - Well, let's see, I have to check and see that there is no leaks ,in the building, that the pipes are not leaking somewhere. Mr. BALL - Anything else you do? Mr. DOUGHERTY - No; I believe that just about covers it. I believe he became "more confused" or distressed after the shooting (comment from Truly) and possible "less reliable". His was quite specific about his position at the time he heard the rifle shot. Mr. BALL - Tell me this---when you heard that explosion or whatever it was--- that loud noise, where were you on the fifth floor-tell me exactly where you were? Mr. DOUGHERTY - Well, I was about 10 feet from the west elevator---the west side of the elevator. Here is a picture that you can use as a reference. Was Dougherty retrieving stock from the boxes to the left of the picture? As the elevator gates were left open at this time, one assumes he was not far from the only elevator that could be "called" at that time. The east elevator was on the same floor. 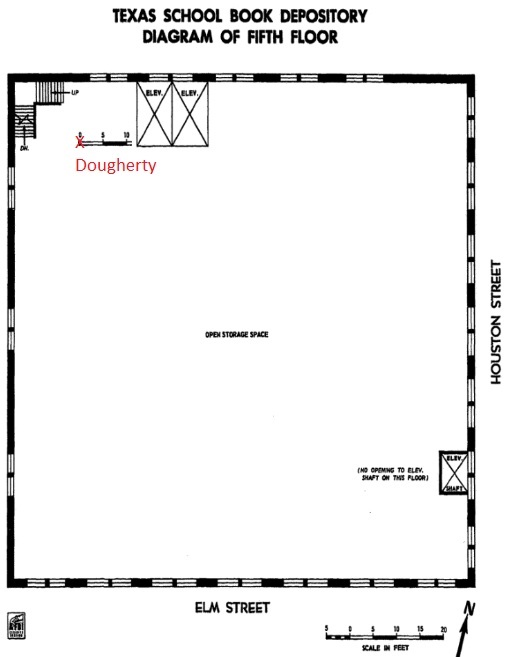 Dougherty was assumed to have moved the west elevator by the time Baker and Truly arrived. Where did it go? Another inconvenience that needed to be clarified, Williams also not very reliable after the shooting it seems. Must have been confused or misunderstood by the FBI. Easy mistake to make. 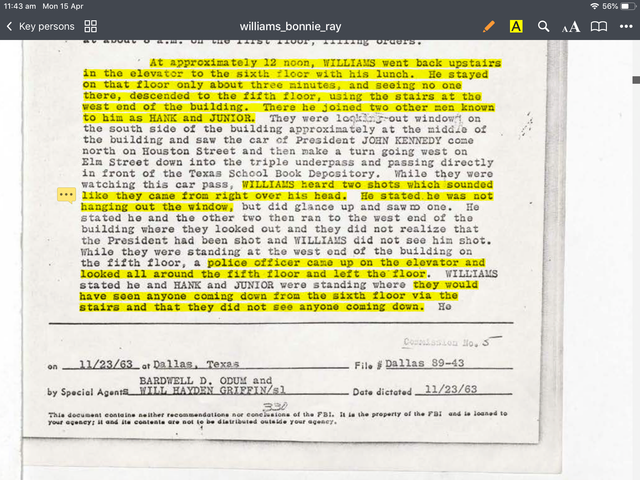 The DPD/WC invesitigators decided that the 6th floor "snipers nest" was the shooting location. They didn't 'confirm' this, Mr Clayden, they decided it (late on the Friday). They knew full well that Mr Oswald had been seen at the front entrance just after the shooting, but switched this sighting up to the lunchroom. Least worst option! Relocating to anywhere by the stairwells on 3 and 4 wouldn't work because they had talked to members of staff who would have been in a position to see a Baker-Oswald-Truly encounter there. 1) Adams is recorded as seeing people, and none of the other 3 saw each other, means that the piece of data is uncorroborated, taken with her later denials and other testimony of an early descent makes it an outlier. 3) There responses were not recorded, so if they were asked, are you saying the information was suppressed or just counted as unimportant. The positions were accounted for at the time fo the shooting but not in the 2 minutes that followed. The crucial window where any shooter from the 6th would need to descend. That may be what she recalled four decades after the fact but we have her signed deposition , including a page of it on which she notated a part that she believed to be in error. And you know that Adams notated this...how? Only if Oswald had actually been on the stairs at all. But then Adams/Styles didn’t hear any footsteps in the stairwell. But then Adams/Styles didn’t hear any footsteps in the stairwell. Didn't they hear their own footsteps? What other testimony of an early descent? You are right. There were only four women in that office.Hollies and Foster were in another room. Styles was adamant that they never left right away. No less than a minute she said. If they did leave early and missed Truly and Baker then they must have really been going. And in three inch heels at at that. Oswald wouldn't have had to sneak past Garner because he would have already passed by before she went back into that area. With the speedsters in their three inch heeled shoes clop clop clopping on the wooden stairs, Oswald was able to follow behind, with any noise that he may have been making being drowned out by that of the speedsters. 3) There responses were not recorded, so if they were asked, are you saying the information was suppressed or just counted as unimportant. The positions were accounted for at the time of the shooting but not in the 2 minutes that followed. The crucial window where any shooter from the 6th would need to descend. The information was counted as unimportant. I seem to recall Garner saying that she was the first to go to the back after Adams and Styles had left.